Soon to be a major motion picture from Acclaimed Cinema Entertainment and Throughline Films. Released this year under the author's real name. Get a copy and find out what you've overlooked! Sam Schuler is starting a new family, trying to begin a respectable life, and trying to extricate himself from the seedy people he once knew. But when his former best friend involves him in a petty drug theft, a local street gang is stirred to action and Sam finds himself the target of harassment from the gang's leader. When the situation escalates from threats to violence to the worst transgression imaginable, Sam's reality is warped beyond recognition. Rules of conduct are forgotten and laws lose meaning as the young man attempts to salvage his sanity, his male pride and his family-to-be. Matthew Louis is a self-taught writer, editor, publisher, graphic artist and jack-of-all-trades. He founded Out of the Gutter and Gutter Books as a way to deliver the brand of intelligent yet high-impact pulp fiction that he favors but finds rare. Matthew lives in the Pacific Northwest with his family. "I read as a writer and believe me, an entire class could be profitably taught using just this novel. The fictive dream is established immediately and there’s no departure point where the reader can leave. 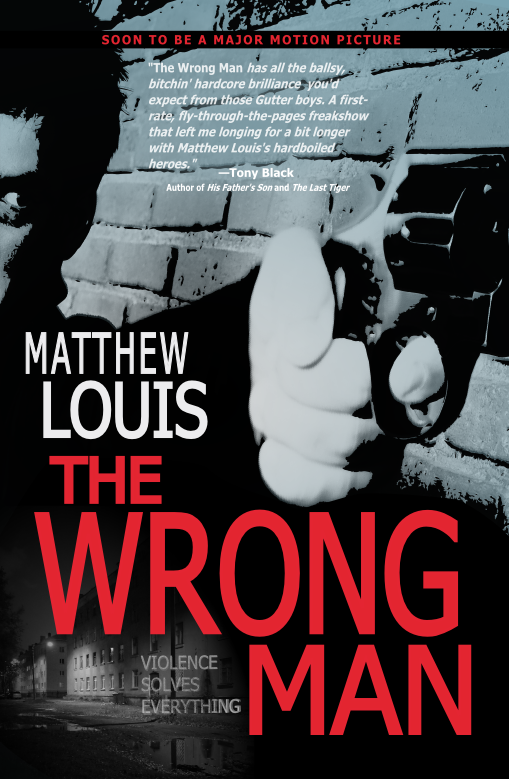 Matthew Louis has crafted one of the best, most interesting, best-paced and plotted novels I’ve read in a long, long time, and I just hope he keeps cranking ‘em out as fast as he can." "THE WRONG MAN is a short, fast trip down the road to hell with prose as hard as a hammer. If your reading diet requires something tough and bloody, here it is. Grab it. " "A first-rate, fly-through-the-pages freakshow that left me longing for a bit longer with Matthew Louis' hardboiled heroes." "Louis weaves a wicked, tight and thrilling tale of a man trapped by best intentions"
"It's been a while since I've read a good street novel, and The Wong Man is a stellar example of the genre. The language is crude, the characters are meaner than mean, and no matter how good a guy's intentions are things inevitably go from bad to worse. The light at the end of tunnel is a false glimmer of hope and Louis keeps dangling it in front of his characters - and the reader - until all the elements come together."